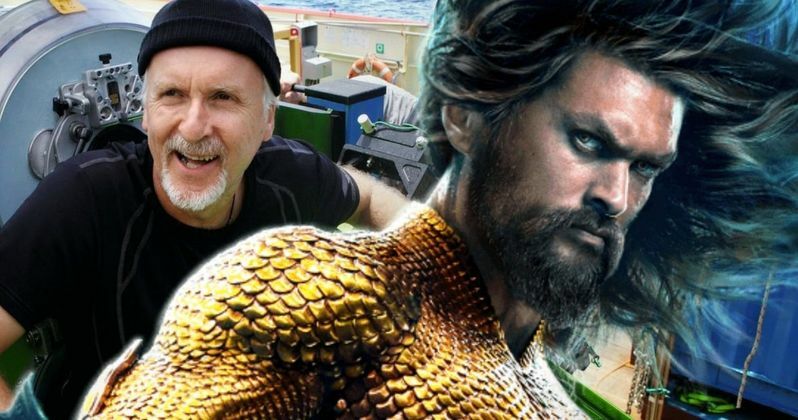 In an alternate universe somewhere in the cosmos, James Cameron directed the Aquaman movie. This was depicted in the HBO series Entourage, where the director played himself, creating one of the highest grossing superhero movies of all time. Cameron never really thought about actually directing Aquaman, but he came close to helming the first live-action Spider-Man. Though he hasn't made a superhero movie yet, his ties run deep in the genre. So with DC Films finally making a living, breathing Aquaman movie that turned out to be an even bigger hit than the fictional one starring Vinny Chase, Cameron is now throwing in his two cents. And he can't help but bash the movie just a little as he tries to throw some praise its way. James Cameron is out promoting his new film Alita: Battle Angel. It's a passion project that he ended up producing instead of directing because he was too busy with the ever-delayed Avatar sequels. So he got Robert Rodriguez to direct instead. While discussing Alita, he let his true feelings about Aquaman be known. And they are mixed to say the least. James Cameron starred as himself in a recurring role in Entourage as the director of Aquaman. Having that experience under his belt, he believes had he actually directed the movie, it would be a lot more realistic. The guy spends a lot of time underwater. And doesn't really agree with the images as James Wan presents them. He goes onto say this, trying really hard to say something nice about the movie. "I think it's great fun. I never could have made that film, because it requires this kind of total dreamlike disconnection from any sense of physics or reality. People just kind of zoom around underwater, because they propel themselves mentally, I guess, I don't know. But it's cool! You buy it on its own terms." What Cameron has to say comes across as a backhanded compliment. We all know he's spent quite a lot of time under the ocean as a deep sea diver. But he likes to rub your noses in the fact, especially when it comes to the job James Wan accomplished with his $1 billion superhero epic. Cameron claims he's spent "thousands of hours underwater" and that he didn't completely enjoy what he was looking at in Aquaman, "because it doesn't look real." James Wan is usually pretty gracious and always a gentleman when it comes to dealing with any negativity towards his movies. He always takes the high road. Though, in terms of directing Aquaman 2? That might mirror what happened in Entourage. Wan is searching for a good script for the follow-up, and won't commit just yet. In the show, James Cameron refused to come back, with Michael Bay taking on the sequel instead. And Vinny Chase was replaced by Jake Gyllenhaal, who in the real world, is now starring as Mysterio in Spider-Man: Far From Home. James Cameron went onto claim that had he made Aquaman, it would have included a lot more environmental activism. Which, to be honest, the movie as it stands now has plenty of for a popcorn superhero movie. Cameron believes Wan's film was lacking in this department. "They did throw in a couple of things with whales and things like that to remind us that we are kind of using the ocean as a toilet and as a garbage dump. So I applaud the film for that." About Aquaman being a big hit at the box office, James Cameron got a little dig in, presumably joking about James Wan's ability to bring in a blockbuster for the studio. "Come back when you hit your second billion and you're on your way to your third - then we'll talk." We'll get a pretty good idea of what James Cameron's Aquaman might have looked like in Avatar 2, which will hit theaters Christmas 2020. More than half of that movie is said to explore the underwater world of Pandora, and it will have a lot of under the ocean action. Will he be able to put his visuals where his mouth is? We still have a little less than two years to find out. These comments come from Yahoo.